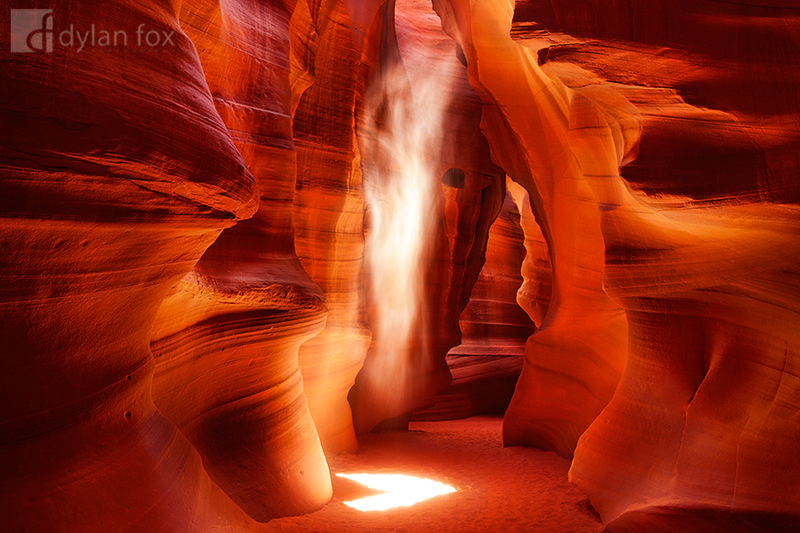 This photograph of Antelope Canyon located within Navajo lands of Arizona captures the colours of this phenomenal place. The smooth sand stone has been eroded over thousands of years by wind and flash floods. The result is remarkable! Light shafts from the midday sun create surreal moments. A local Navajo Indian threw sand into the lights path and my capture reveals a figure that in my eyes looks as if it is dancing in the canyon. Also notice the where the light reaches the ground creating a unique love heart. This place really blew me away! It is a location I will never forget! Secure your limited edition, Antelope Canyon photographic print, 'Soul Dance', by selecting your desired print size in the menu to the right.